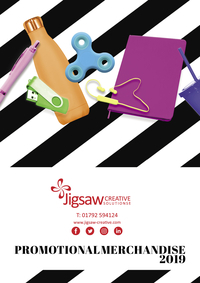 At Jigsaw Creative we understand that every brand comes in different shapes and sizes. That is why our team works with each customer differently, using a tailored mix of marketing components, depending on what you want to say, where and who to. We strategically take a brief, can brainstorm bespoke concepts and- using promotional gifts, printing, web, and branding display- create a buzz about your business. Or, if you have a specific requirement and we know it is a winner, we guarantee your order will be on time and to your budget…we are used to short timescales! We like a challenge. What might seem like a conundrum to you is a genuine opportunity for us to outsmart your competition and deliver a return on investment. Our marketing collateral has substance and style; we can drive your business goals as well as creating exciting and memorable material that is not only seen, but remembered. We take a collaborative approach with our portfolio of clients across Wales, trying different angles until the right, integrated idea slots into place for you. Our award-winning team is brimming with marketing collateral ideas. We know what we’re good at and have strategic partnerships in place with trusted, quality suppliers if we can’t do the job for you.